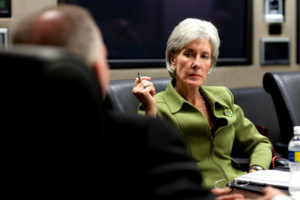 WASHINGTON — With the White House exposed as a scandal-ridden and untrustworthy source of power, the Republicans are investigating the circumstances surrounding another controversy: Health and Human Services Secretary Kathleen Sebelius’ fundraising efforts for ObamaCare. ObamaCare, known as the Patient Protection and Affordable Care Act (PPACA or ACA), was passed on partisan lines in the House and Senate, and has been a focus of strident criticism by Republicans and the private sector. It has raised health care premiums and have pushed businesses to reduce full-time workers to part-time workers to shoulder the health care mandate and its costs. We at AIM have written an analysis on the health care law and how it affects Americans. This does not even address the current litany of scandals facing the Obama White House. Eric Holder, Obama’s Attorney General, is being criticized for monitoring the phone lines of Associated Press reporters for two months last year. The mysterious details surrounding the deadly terrorist attack on Benghazi are starting to emerge and have given the administration a black eye on foreign policy. And, the emergence of the IRS scandal of targeting Tea Party and conservative groups has killed any second-term agenda that Obama has outlined. According to a Reuters analysis, this is quite an intriguing case. Sebelius went to private groups and asked for donations to help fund ObamaCare, some of which said they will consider her offer. She is asking donations from companies to a non-profit group, Enroll America, which is to publicize and sell ObamaCare to the American public. The problem? It is very unusual that a federal official solicits organizations and individuals who they regulate, although Sebelius solicited H&R Block, a tax preparation company and the Robert Woods Foundation.